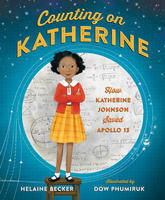 The picture book Counting on Katherine: How Katherine Johnson Saved Apollo 13, by Helaine Becker, illustrated by Dow Phumiruk, is the true story of a NASA aerospace technologist and her early beginnings as a gifted math student. Her calculations were so reliable that John Glenn bypassed the computer-generated numbers to ask if it passed "the Katherine test." When Apollo 13 exploded, Katherine calculated a safe flightpath home, while three astronauts awaited their fate in outer space. The Amazing International Space Station, by the Editors of Yes Magazine, covers the ins and outs of this incredible scientific feat. Fascinating facts are presented in a kid-friendly way. Did you know it takes eight minutes to leave the earth’s atmosphere, and 41 hours for the shuttle to find its orbiting “parking spot” on the ISS? A day and a night takes 90 minutes; astronauts on the ISS watch a sunset every 45 minutes? Sixteen countries contributed to the building of it? Pieces, some as big as a bus were constructed on earth, then transported to space like a giant lego kit? This book is interspersed with experiments i.e. simulating working with thick gloves outside the space station; making space soup; growing crystals like those grown in microgravity; and moving in space, using a swivel office chair. 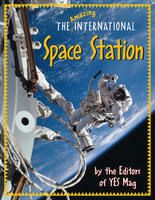 Readers can’t help but feel like they’ve been to the Space Station. 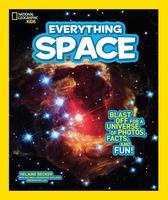 Past Silver Birch nominee Everything Space, by Helaine Becker and Brendan Mullan, is a great resource and simply a good read. Its glossy, eye-catching photos and web-style layout offer a multitude of interesting facts. Ever wonder why Pluto downgraded from planet to moon? What about “spagettification”—how objects get stretched out as they descend into a black hole? 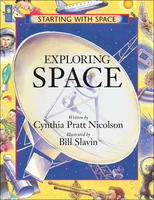 The strength of Exploring Space, by Cynthia Pratt Nicolson, illustrated by Bill Slavin, is its Q&A format, which informs the reader of the history of space travel. This one is also interspersed with simple experiments demonstrating a spiral galaxy, a balloon rocket, how to “read” satellites in the night sky, simulate zero gravity, use a binary code and make a map of the universe using bubbles. 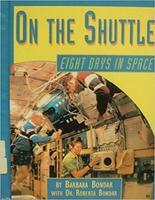 On the Shuttle: Eight Days in Space, by Barbara Bondar and Dr. Roberta Bondar, is a step-by-step account, from pre-flight prep to lift off, to conducting experiments in space. By the end of this one, you’ll really feel like you’ve been on the journey. 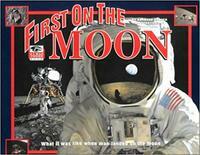 Similarly, First on the Moon, by Barbara Hehner, illustrated by Greg Ruhl, provides a first-hand experience of the astronaut experience. The narrative, told from Buzz Aldrin’s family’s point of view, along with sidebar facts, photos and illustrations, gives a clear understanding of the achievement of Apollo 11. It includes the short 2.5 hours Armstrong and Aldrin spent planting a flag, collecting samples, and conducting experiments, while Collins, the lone astronaut left in the shuttle, circled the moon 14 times, often beyond radio contact. 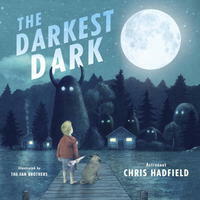 A companion picture book to this might be The Darkest Dark, by Chris Hadfield, illustrated by The Fan Brothers. Grade 6 students will be inspired by this well-written, beautifully illustrated picture book about Hadfield as a boy, gathering round the television with his family to watch the moon landing. At that time, no Canadians were allowed to work at NASA, the afterword tells us, but 23 years after Neil Armstrong’s feat, Hadfield overcame his fear of the dark and made his dream come true. 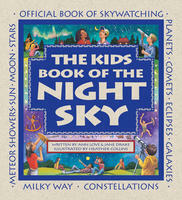 The Kids Book of the Night Sky, by Ann Love and Jane Drake, illustrated by Heather Collins, is a hands-on “maker” book, to help students understand and read the night sky. Activities include: using stars to tell time, constellation flash cards, and heavenly word games. The book includes four seasonal star maps, a glossary, riddles, and an interview with a star revealing his life story, from gas cloud to white dwarf, along with origin stories and legends.